The one thing that most organizations struggle with is the complexities of having workforces and operations in multiple countries. At Workday, we’re always thinking about how to provide more value and reduce complexity to deliver a more elegant customer experience. So today, I want to talk a bit about Workday’s global payroll strategy, and how we’ve developed it specifically with these goals in mind. First off, we made an important announcement today for our global customers about the availability of Workday Payroll for the UK. It follows our payroll offerings for the U.S. and Canada, but with additional support for UK-specific regulatory requirements. While these country-specific payroll offerings are important, our broader global payroll strategy is centered on our partner program, Workday Global Payroll Cloud. This includes bi-directional, pre-built integrations for moving data between Workday Human Capital Management and other payroll systems. These integrations are deployed and managed by certified partners that are members of the global network. At Workday we pride ourselves on our 97% customer satisfaction rate, and every single company strategy we develop is tied to maintaining it. We decided early on that building out localized payroll solutions for more than 100 countries where our customers do business was not the right approach. Each country has its own regulatory and tax environment, local language requirements, and vastly different data security laws. In many instances, regional, specialized payroll providers are what’s best for our customers, and they should be able to choose and integrate with the right third-party payroll provider for their specific needs. Choice is important for customers, and that’s exactly what we offer through Workday Global Payroll Cloud. With combined payroll data from local payroll providers and HR data from Workday HCM, customers have the visibility to make better workforce decisions. It’s one global system with a consistent user experience—even when third-party payroll solutions are running behind the curtain. Customer adoption has been strong for the program and we’ve seen a lot of momentum: Workday has certified nine new countries since last summer, bringing the total number of countries with certified integrations in Workday Global Payroll Cloud to 85. I’m also excited to announce even more traction: we’ve added Payroll Inc., a payroll outsourcing service headquartered in Tokyo, Japan, to the growing list of our partners. Payroll Inc. provides outsourcing services reaching approximately 860,000 employees, and will be a key contributor to our global payroll success in APJ. This momentum is just the tip of the iceberg for us. 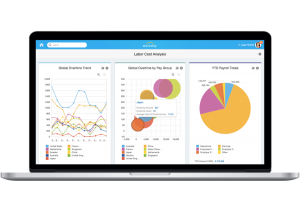 We’re focused on continuously optimizing and expanding the Workday Global Payroll Cloud ecosystem to ensure that we maintain the highest level of satisfaction our customers have come to expect from Workday.